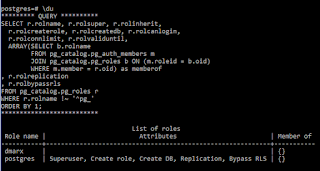 PostgreSQL's psql interactive terminal tool provides several useful "backslash list commands" such as \d (lists "relations" such as tables, views, indexes, and sequences), \dt (lists tables), \di (lists indexes), \ds (lists sequences), \dv (lists views), \df (lists functions), \du (lists roles), and \? (displays help/usage details on backslash commands). These commands are concise and much simpler to use than writing the queries against PostgreSQL system catalogs (pg_class, pg_roles, pg_namespace, pg_trigger, pg_index, etc.) and information_schema that would provide the same types of details. The PostgreSQL psql documentation states that the psql options -E and --echo-hidden "echo the actual queries generated by \d and other backslash commands." The documentation adds commentary on why this is useful, "You can use this to study psql's internal operations." When psql is started with the -E or --echo-hidden options, it will display the query associated with a backslash command before executing that command. 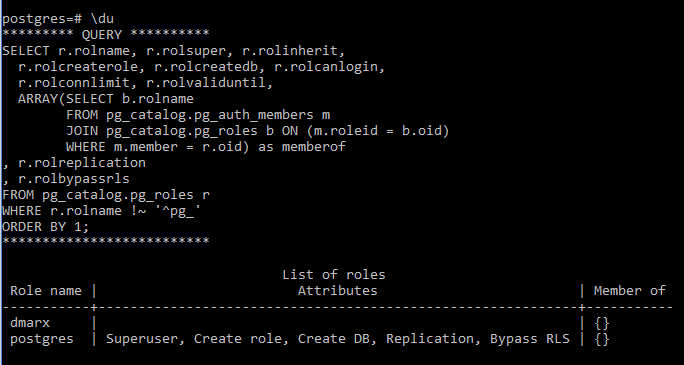 The next screen snapshot illustrates this for the \du command used to show roles.